The UDP-203 features a handsome, black brushed-aluminum faceplate with an LCD status display right below the disc tray. A front USB 2.0 port provides easy access for files stored on mass storage devices, including 60 frame-per-second 2160p video. You’ll also find a complete set of transport controls here (play, pause, stop, track forward, and track back) that can also be used to navigate menus. There are two USB 3.0 ports on the rear panel, along with eight RCA jacks so you can deliver analog stereo or surround sound to an older A/V receiver or amplifier that doesn’t support HDMI (or if you think the Oppo’s DAC sounds better than what's on your current gear). Oppo also provides optical and coaxial S/PDIF outputs. If you’ll be making more modern connection, there’s HDMI Out (audio and video), audio-only HDMI Out (for audio equipment that supports HDMI, but not HDCP 2.2), and even an HDMI in (for reasons we’ll get into later). There’s really nothing out there that the UHD-203 won’t send an audio signal to. The UDP-203 isn’t lacking for ports, though component and composite video aren’t among them. But if you need those, you might want to ask yourself why you’re buying an Ultra HD Blu-ray player. If you have an advanced connected-home system (or you’re a custom installer), you’ll appreciate the presence of an RS232C serial port and 12V trigger input and output for tying similarly equipped high-end gear together. There’s an infrared sensor back there, too, to eliminate having an IR blaster spoiling the view from the front. The recently reviewed Panasonic DMP-UB900 does audio very well, but the UDP-203 does it even better. Like Panasonic’s player, the Oppo can play DSD files, but it will also play SACD and DVD-Audio discs that Panasonic's device can't handle. The Oppo will also play multi-channel DSD files and many, many other audio file formats, including APE, Apple lossless, and FLAC. The more common WAV, MP3, OGG, and WMA are also supported of course; in fact, the only test files the UDP-203 couldn’t handle were the less common Opus, Windows Lossless, and any type of 32-bit 96kHz files. It handled the more common 24-bit/96kHz files just fine. The UDP-203 can put out up to eight channels of analog surround sound (that’s seven loudspeakers plus a subwoofer), and it will pass Dolby Digital, Dolby Digital Plus, and DTS bitstreams—as well as high-resolution Dolby TrueHD and DTS-HD Master Audio bitstreams—over HDMI to a compatible sound bar or A/V receiver. There’s also support for the object-oriented audio codecs Dolby Atmos and DTS:X, but there’s no support for Auro 3D. Less-expensive Ultra HD Blu-ray players, such as Samsung’s UBD-K8500, don’t provide analog surround output. Microsoft’s Blu-ray-equipped Xbox One doesn’t either; in fact, it doesn’t even pass high-resolution audio bitstreams over HDMI, but that’s supposed to change sometime in 2017. The UHD-203’s remote control was our least favorite feature. It has very good response, even from very steep angles, but it’s very large and has a daunting array of buttons. The remote is laid out logically enough, and the backlit buttons are easy to see in a darkened room, we just wish there were fewer of them. Though not a difficult remote, we’d prefer fewer buttons and more on-screen functionality. It’s just easier to see in the dark, though the Oppo remote is backlit and so large it’s hard to lose. The onscreen user interface, on the other hand is clean, simple, and easy to navigate. It did enumerate a couple of directories on our test USB media that should have been hidden, but it found files quickly and accurately, it was generally intuitive, and it never lagged. One of the reasons the UHD-203’s user interface is so clean, however, is that there are no apps to clutter it up. You can add this UHD Blu-ray player to your wired or wireless home network, of course, but you can’t log into your Netflix, Hulu, Amazon, YouTube, or any other video-streaming service from its UI. We won’t describe that as a shortcoming, but it is something you can do on pretty much every other Blu-ray player. Oppo plays up the presence of the UDP-203’s HDMI 2.0 input, suggesting that you can connect a dedicated streaming box—a Roku or an Amazon Fire TV—to that if your TV or A/V receiver doesn’t have enough HDMI inputs. Having an extra HDMI input is a plus, and most modern TV have their own app offerings anyway, so we’ll buy into that reasoning. But if you don’t already have a smart TV or a streaming box, and you want access to those online services, you’ll need to buy another box to supplement the Oppo. Oppo says it’s optimized the UDP-203’s disc loading, and our experience bears that out. This player does indeed get you into the movie (or the tunes) faster than other players we’ve tested. The UDP-203 handled all the Ultra-BD, BD, DVD, and CD discs we threw at it, with the one exception being a burned BD disc. Actually, it mounted and played most of that disc’s contents, it just consistently locked up when we tried to drill down into a particular submenu. That still puts it one up on the Panasonic DMP-UB900, which didn’t display any of the menu. Samsung’s UBD-K8500 and the Xbox One S both handled said burned disc fine. The UDP-203 is undeniably handsome, and sports navigation controls on the front panel so you don’t have to go back to the couch to hunt for the remote. Video output quality was excellent, although HDR piped into a 65-inch LeEco Super4 4K UHD TV was darker than with the combination of a Samsung UBD-K8500 and Xbox One S. As the Super4 is weak on peak brightness to begin with, this made things a bit muddy. Increasing the brightness and contrast just a skosh evened things out. The UDP-203 is the only player we’ve tried that lets you tweak HDR settings. There’s even an HDR on/off button on the remote. The Oppo played nearly all our video test files, including most 60-frames-per-second 10-bit HDR types. Legacy MPEG and h.264 were no issue. The only video files that failed to play used the h.265 (HEVC) main 6.1 profile, the main 5 profile played fine. As Oppo seems rather obsessive about its product, we’re guessing this will be fixed in short order. Supported Image formats, on the other hand, are limited to JPEG, PNG, BMP, and some 3D types. Audio reproduction was excellent. Oppo touts the unit’s 32-bit AKM AK4458VN DAC, which sounded great and had no issues rendering SACDs, the DSD rips made from them, or any of the audio files we previously mentioned. 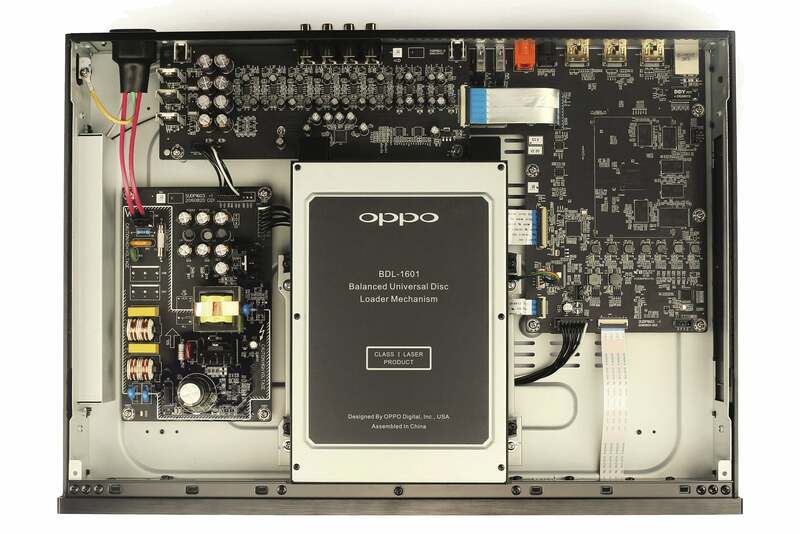 Here’s a gut shot of the Oppo UDP-203. The AKM AK4458VN DAC is mounted on the circuit board directly behind the disc drive. You can now add support for Dolby Vision via a firmware update (you can find the details on Opp's website). Dolby Vision differs from HDR-10 in that rather than one adjustment at the beginning of a video, it can adjust TV settings on the fly for each scene. This allows much greater refinement in the handling of light and dark scenes within the same movie. Dolby Vision also supports 12-bit color depth while HDR-10 is limited to 10-bit color. The bit-depth difference is noticeable, if barely; you’ll mostly see it in the accuracy of colors on those few TVs that are capable of handling 12-bit color. 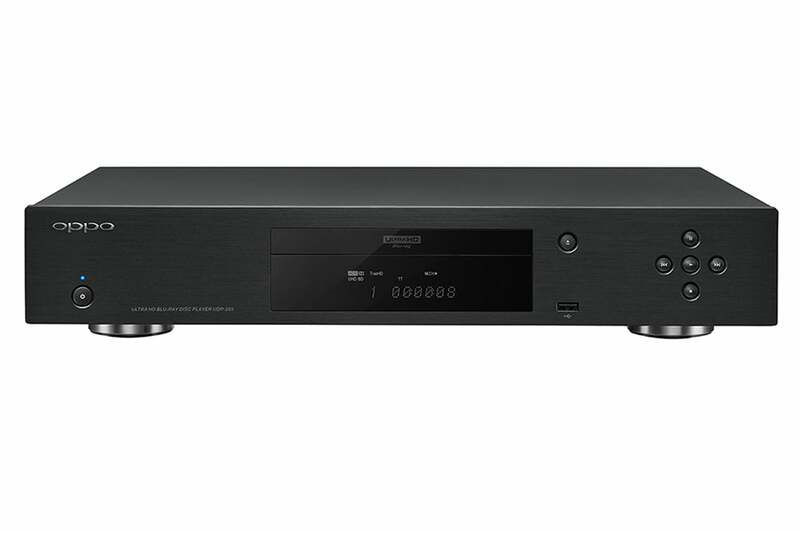 Is this the UHD Blu-ray player to buy? Most users will have app environments on their TVs for connecting to streaming services; those who don’t probably already have a streaming box they like. So the absence of app support in the UHD-203 is a minor concern. Purists might even consider it a plus. 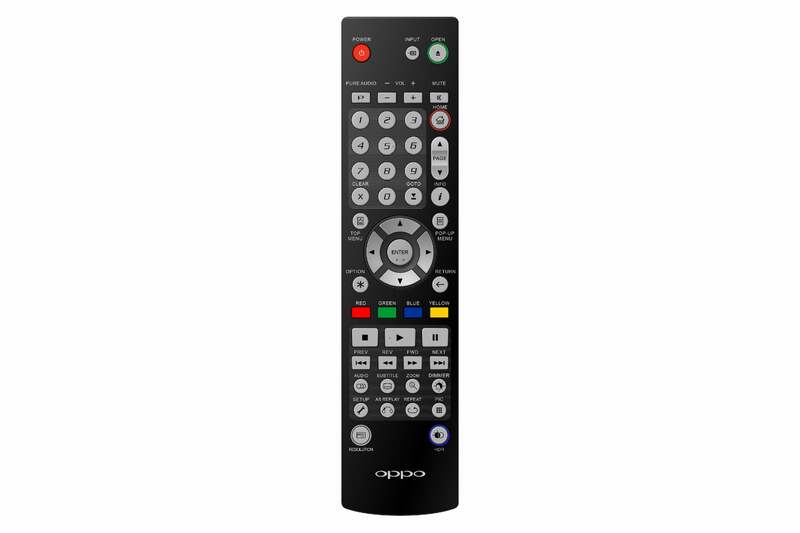 We didn’t dig Oppo’s remote, but we love this player’s features, as well as the quality of both its audio and video, which are as good or better than anything we’ve heard or seen. The UHD-203 supporting Dolby Vision also puts it one up on its competitors, none of which can be upgraded to support it. Scuttlebutt is that Dolby Vision will start showing up on UHD Blu-ray discs in the near future. HDR-10 is great, but Dolby Vision is better, especially over the course of a movie thanks to its scene-by-scene optimization. $549 is a lot of money for a Blu-ray player, especially with the Xbox One S out there for nearly half the price. Then again, Panasonic’s DMP-UB900 has fewer features and it’s going for $599.99 at Panasonic’s web store. The Oppo UDP-203 is the cream of the crop for now; perhaps until Oppo ships its “audiophile” UDP-205 (price TBD) in early 2017. If you want the best, cut the check. If you're looking for the best 4K UHD Blu-ray player, Oppo's UDP-203 is the one to buy.